With an aim to stand tall on the expectations of our esteemed clients, we are engaged in providing Hydraulic Valve Plates Repairing Service refurbishing and repairing service. Under the surveillance of our knowledgeable professionals, this service is rendered using the latest techniques and tools as per the set industry norms. We are immersed in providing our patrons Hydraulic Valve Repairing Services. These services are offered to the clients at best market price. Our engineers employ advance techniques and tools to repair AMCA hydraulic valves. 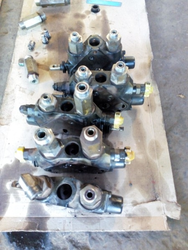 Best quality of Hydraulic Valve Repairing Serviceis provided by us to customers as per their requirements.
. These are accessible at reasonable rates.